Women with significant others can often feel they slip into the role of PA when it comes to organising their man’s life. And they’d be right. Men still rely on their partners to remind them what they’ve got planned, despite owning the latest gadgets, a new study reveals. New research released today shows one in five men (21 per cent) bank on their partners remembering what they have planned on the weekend. That’s right, sort your lives out men! Because, as we know, you’re all a bunch of overgrown children unable to look after yourselves without your female partner sorting everything out for you, right? It’s a wonder you even got dressed this morning! Roy Blanga, managing director at Groupon UK who conducted the study, said: ‘It can be difficult to get events booked in when you’re dealing with friends and family. ‘But there are so many easy-to-use mobile apps and websites out there to help us find inspiration, there’s no reason not to the rescue the situation and organise a get-together in the spur of the moment. We know you’re useless, men, but the least you could do is make an effort to arrange events – starting with the events listed on Groupon, for one. This entry was posted in Uncategorized and tagged daily mail, genderism, groupon, katy winter, men vs women, roy blanga on December 2, 2013 by Michael Marshall. Few would argue that motherhood is one of toughest challenges a woman can face in her life. And new research suggests that many mothers feel rather constrained by their role. 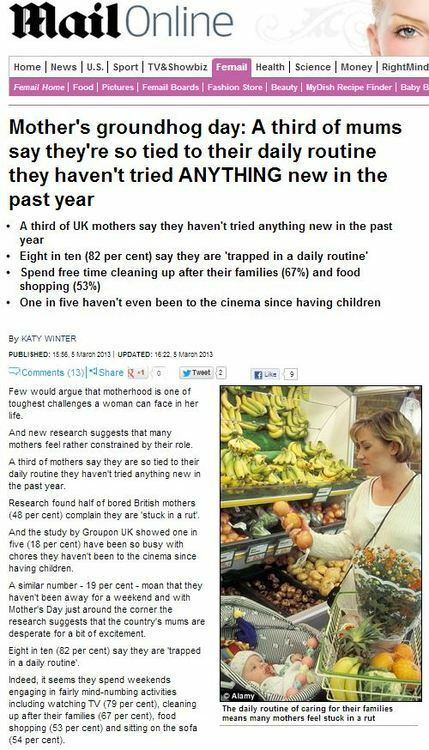 A third of mothers say they are so tied to their daily routine they haven’t tried anything new in the past year. Research found half of bored British mothers (48 per cent) complain they are ‘stuck in a rut’. It seems mothers these days have it tough, with few poor mum’s getting to go out to the cinema, or to enjoy a weekend away, or to be pampered in a spa for a day, or even to have a romantic meal for two. We know all of these things are lacking from the lives of our wives and mothers, because a survey carried out by Groupon – the voucher website offering deals on trips to the cinema, weekends away, pampering spa days and romantic meals for two – discovered exactly what mum’s want most in their lives at the moment that can be bought on Groupon. In utterly unrelated news, on Mother’s Day (tomorrow), children traditionally buy gifts for their mother, as a show of their affection and appreciation. This entry was posted in Uncategorized and tagged daily mail, groupon, katy winter, roy blanga on March 9, 2013 by Michael Marshall.